Though not recording himself, Dave Stewart's been busy for the past 13 years as a producer and songwriter. In 2011 alone he produced albums by Joss Stone and Stevie Nicks. The Blackbird Diaries is his first album of his own material since 1998. It's titled for the Blackbird Studio in Nashville, where the set was recorded; it's owned by Martina and John McBride. Stewart cut and produced 15 songs in five days with John McBride behind the board and longtime collaborator Mike Bradford co-producing. Much was recorded live in the studio and the sound of the dozen songs that made the album reflects that; its energetic crackle and rawness weren't mixed out. Given the caliber of the players, most of whom are regulars on the cookie-cutter records pumped out of Nashville these days, that's saying plenty. Pedal steel boss Dan Dugmore, Neil Young's touring drummer Chad Cromwell, bassist Michael Rhodes, guitarist Tom Bukovac, and keyboardist Mike Rojas probably had the time of their lives making a record that sounds this loose. 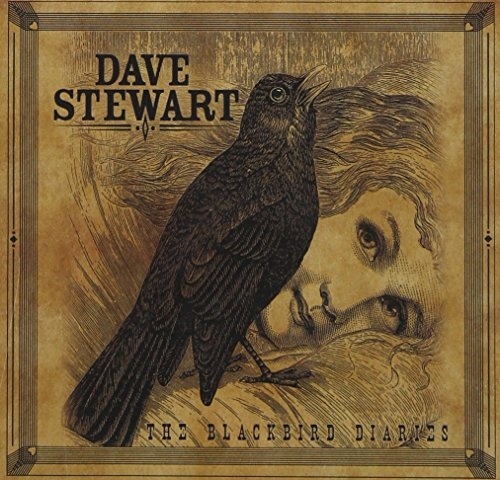 The Blackbird Diaries doesn't resemble anything Stewart's released previously. These songs are rooted in basic rock & roll, country, blues, and some modern approximation of all of them simultaneously. Stewart claims the songs were written quickly, and in places, that shows. "The Gypsy Girl and Me" has so much of Bob Dylan's "Subterranean Homesick Blues" in it that Dylan should get a co-write. That's the extent of the bad news, however. The roots rock in "So Long Ago" recalls the guitar vibe of the Rolling Stones, while the balladry of "All Messed Up," a duet with Martina McBride, marries pop and country so seamlessly that it's one of the most successful ballads either has ever cut -- Dugmore's steel is like a third voice, swooning and swooping through the mix. "Magic in the Blues" channels the country rockabilly of Johnny Cash reverently, but that's not a bad thing. "Cheaper Than Free" is an Everly Brothers-style bare-bones ballad sung in duet with Nicks, and it's as good -- or better -- than anything on her most recent recording. "One Way Ticket to the Moon," with the Secret Sisters, is a nuevo Spanish-flavored number, complete with moody marimbas. It's atmospheric and narcotic, with a noir-ish tinge. "The Well" is an old-school country number that channels Stonewall Jackson, but could have been sung by Nick Cave. The album closes with the same bombastic, celebratory Stones-ish roots rock it opened with in the hilarious "Can't Get You Out of My Head." The Blackbird Diaries isn't for everyone: it's mainstream but not sterile; it celebrates roots music without overly indulging it or neglecting pop; in short, it's catchy as hell and better than any Stewart solo project to date.